There were a lot of things I did not take into account when I was writing that our floor in the first level will be ready last weekend. I was a way too ambitious! As always in an old house, a lot happens on the way you can’t see in advance. 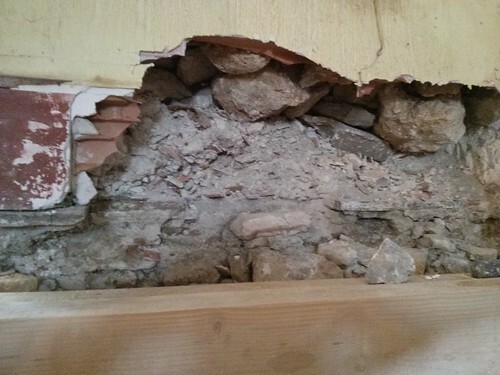 E.g., when removing the rest of the old floor, we found a fake wall and had a 2 sq.m area with about 20 cm of concrete. This alone took half a day to remove it. Before we could demolish all parts of the old floor, we also had to build a frame for the new staircase to the upper level which means putting in a new beam (dig the wholes and close it after placing the beam). 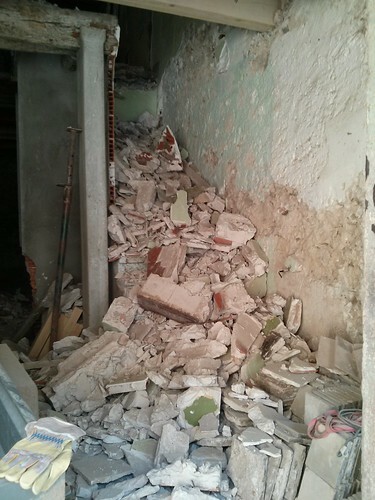 And then, the demolition of the two old staircases was not done in an afternoon. Another three old beams needed to be removed as they were cut when the staircases were built-in. Huge wholes were left, at least one we could use to place a new beam but for two other beams we had to make new wholes. Finally, we needed one day to bring all the rubble to the dump site, 4.5 tons! Since today, we saw and lay the rafters so that we hopefully tomorrow start to put the floor fill on our 75 sq.m first floor.